When I was young and we had guests coming over one of the dishes my mum always made was kabsa. Serving platters loaded with spicy golden rice and chicken topped with almonds and raisins would take center stage on the table. My part in it was to chop the tomatoes,slice the peppers and grate the carrots. You can say I was mum’s sous chef lol. I was also in charge of decoration and final presentation. I would use carrot and cucumber slices and arrange them something like this, or if I had time there would be more elaborate plans with tomatoes and mint involved. 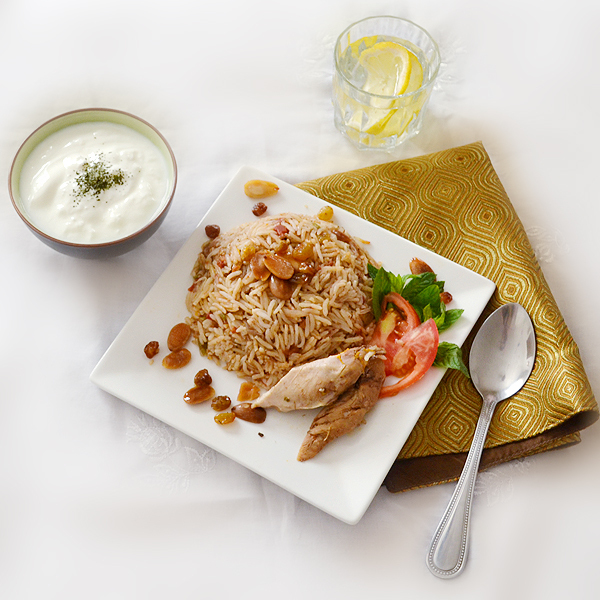 Kabsa or kabseh is one of the traditional dishes served in the Arabian gulf area. It is a Unique mixture of rice (has to be long grain and you can use basmati), meat (chicken, beef, goat, lamb or even camel), spices and vegetables topped with nuts and raisins. 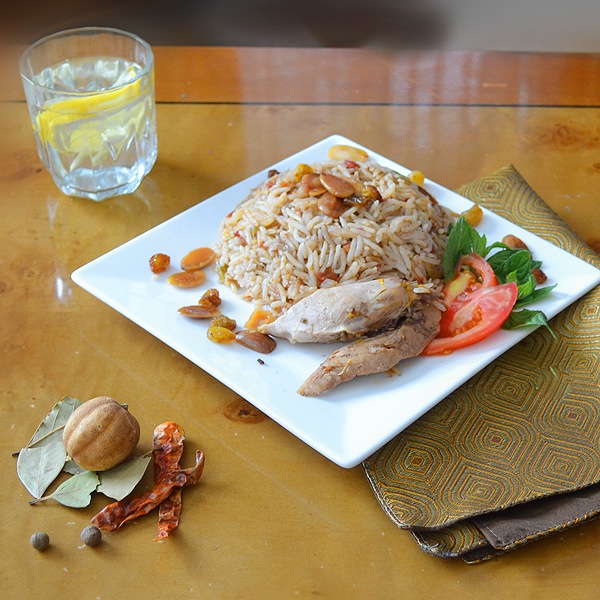 The secret to Kabsa’s identity and taste is the blend of spices used in it. 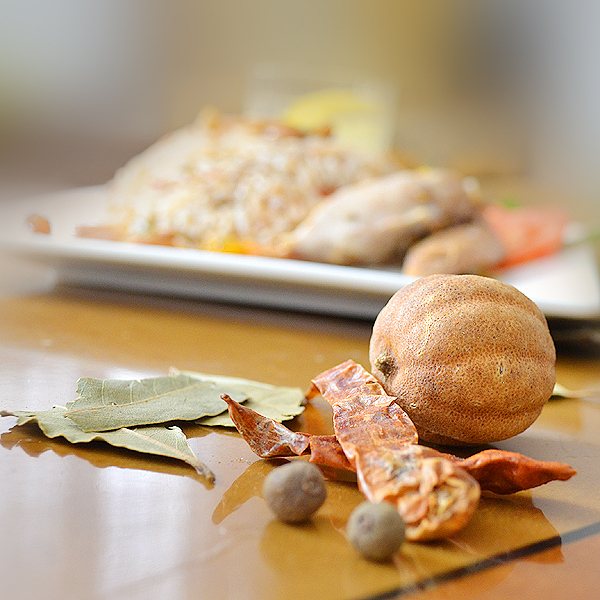 black pepper, all spice, cloves, cardamom, saffron, cinnamon, black lime, bay leaves and nutmeg are some of the spices that lend their magic to make kabsa a special and memorable dish. 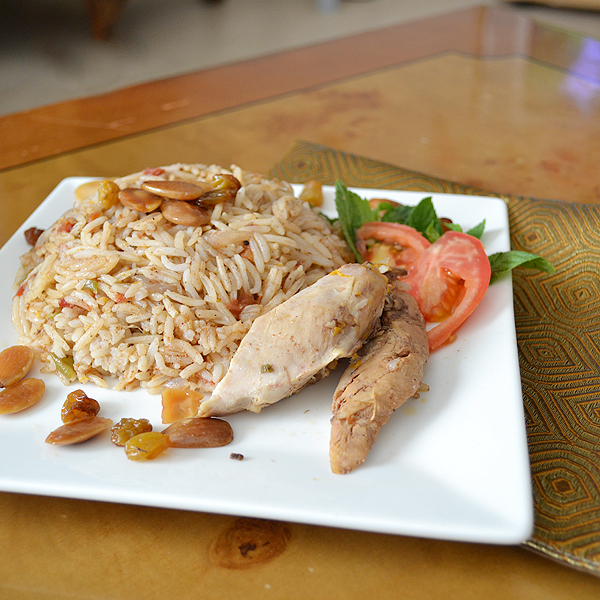 Today I am sharing my own Kabsa recipe which is mildly adjusted from my mum’s and she makes awesome kabsa. I urge you to give it a try as is and from there you can adjust the spices, change the vegetables and make the recipe your own. I cook the chicken in a pressure cooker to save time, if you don’t have it you can cook the chicken in a normal pot, it will just take a little longer. Wash the rice 4-5 times discarding the water every time, drain and set aside. In a pot or pressure cooker add the chicken and add enough water until the level is 2-3 cms above the chicken. Add the bay leaves, all spice berries, cinnamon, cardamom and onion. Bring to a boil and then lower the heat, cover and cook for 10 minutes (if using a pressure cooker) if not you need to cook the chicken untill it is done. In another pot add the olive oil and saute the onions over medium heat until they become almost translucent. Add the carrot and pepper and stir for 5 minutes. Add the tomatoes and stil for 5- 10 minutes or until the tomatoes are soft and begin to breakdown. Add the spice and rice, stir for 2 more minutes. Nestle the chicken pieces between the rice. Cover and cook over low heat until the rice absorbs all the fluid. Uncover,fluff the rice with a fork. To serve garnish with almonds and raisins that you have fried in oil. 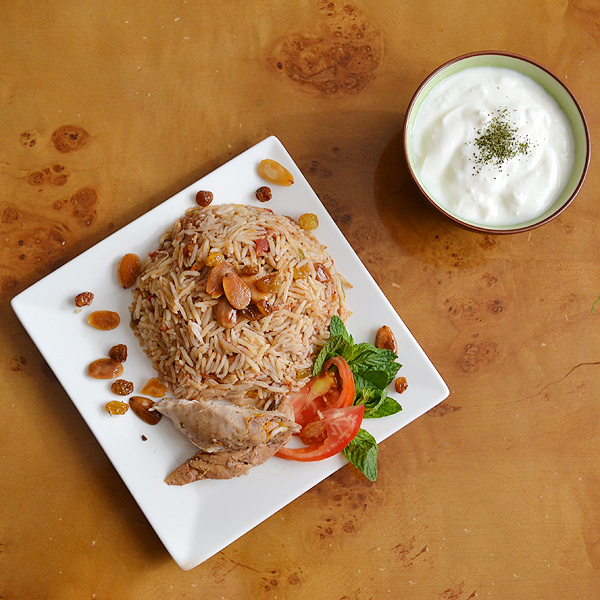 Don’t discard the oil, you can drizzle it over the kabsa to add a double dose of flavor because it will be infused with almond and raisin. Posted in Arabic and middle eastern recipes, Rice and tagged dried lime, kabsa, kabseh, postaweek2011, rice recipe, spice. Bookmark the permalink. I’m so glad I found you! We enjoy the foods from this region of the world and can’t find them where we are living now. I will have to find a resource for the dried lime but can’t wait to try this recipe. Another winner by the Food Doctor!! Loving it!! Such a very pretty presentation! I love how you helped your mother as a child! I can almost smell this. Just beautiful and so fragrant. Wonderful photos too. Where can I get the loomi from in USA? Hi, One of the spices you mentioned in black lime…i’m presuming its citrus…i’ve never heard of it? This dish sounds and looks delicious! Also I say istha, not ashta… I say baqlawa, not baklava… I say…shush fati now please and go study! It looks very simple to make but yet you made it look very elegant. I am looking at the shot on that first photo. Very nice presentation of the dish. I hope you are enjoying your weekend, Sawsan! Hi Sawsan! I remember your carrot and cucumber decoration! I didn’t know you were practicing that from childhood! 😉 Now, I bet your mom was a great cook, knowing your cooking repertoire! I’m not familiar with Kabsa, but this sure looks delicious! Looks beautiful – very celebratory and lots of exciting flavours going on! This rice dish does look so lusciously golden and full of flavor. I think it would complement any main dish. Thanks for sharing a family favorite…those are ALWAYS the best recipes hands down. Have a great week. i am already dreading Monday! AGGGGHHHH!!! I know what you mean about dreading Monday! So good. Great flavors and totally doable. I’ve never tried making kabsa at home but we sure do love it. I’ll have to give this a try! It is really easy and you can change the spices, make it more or less spicy ..
Great different flavors and textures there! I have never hear of Kabseh before, but it looks delicious! I love oatmeal and I love mushroom, but would have never thought of putting them together in a soup. Fantastic! Love love love everything about this!! It looks so amazing, Sawsan! I am familiar with all the spices you used and can imagine how flavorful this dish will turn out. Teslami ya sit el kol..
That looks delicious, will be trying this soon. Thanks for the share! This sounds great Sawsan! I adore any type of rice dish and will definitely be trying this soon! I can only imagine how tasty this must be! Wow! I love the spices! tislamy ya a7la food doctor! 3an jad kteer zaky al recipe hatha! While making the kabseh, when you nestled the chicken in, did u debone it first? Because in the photos, it looks like there were no bones just pieces of chicken around plate. Hello, I’m wondering how much water do you add into rice and how long do you cook it? I always have problem with long gain rice and the rice comes out too soft and mushy. Thank you very much. The amount of water differs with different brands. For long grain rice, it is usually 2 cups of water for every cup of rice. If you are worried, start with 1 and 3/4 cups of water per cup of rice. Add the water, cover the pot and cook over low heat until the rice completely absorbs it (15 minutes). Thank you saswan for this mouthwatering recipes…I have been to saudi many times during my childhood days and my early childhood memories involve being surrounded by delicious things around there… One good things is my grandmother’s recipes…She was an expert chef and her signature dish was the Kabsa recipes. Before penning down her recipes she passed away. I had tried almost 8 of yor recipes and all came well. My paternal aunty is using your honey pistachio sesame cookies for her guest and now she’s expert in it, my aunty tried your banana chocolate jam and watermelon rind jam for her kids breakfast and my brother had tried your shish tawook and yet to try more….